Happy Vinayaka Chadurdhi to all my friends. Here is a photo of the celebrations at my home. This month is really a blessed month as I am getting showered by awards from my blogger friends. I received the Kreative Blogger Award from, Suma & Vidhas. 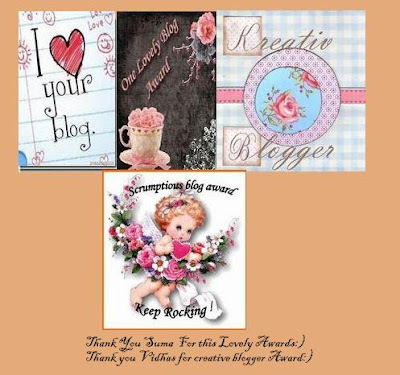 And lovely blog award,I Love your blog &scrumptious blog award from My friend suma .Thanks suma and vidhas .These awards mean a lot to me. Reading Books &Trying to translate Sanskrit slogas in English. Suma is a lovely & affectionate girl, she looks beautiful... Vidhas is a lovely person, ,Both are a awesome bloggers,Very talented, friendly and sweet. 7. If you could have a house totally paid for, fully furnished anywhere in the world ,where would you like it to be? Peacock colour saree with small glass work. I am very simple and outspoken person. I don’t use cosmetics or make up. First think of shopping then adjust with what I have. I sit alone and watching moving clouds..It gives me peace, makes me free from heartache and pain, It gives me comfort, and dries my tears. Or else go for a long walk. Jaishree Means "goddess of victory" in Sanskrit. I like all blogs. Each and every one has their different style of presentation. To be a Mom and to know you are special for someone. Thank you so much suma & vidhas for thinking of me and passing me on these lovely awards. I really appreciate it. I am passing these awards to all my blogger buddies. Happy ganesh chathurthi Jai akka...lovely ganesh idol, looks so divine..nice to know more about u & congrats on ur awards.. Happy Ganesha Chaturthi.Good to know moe abt u.
Lord Ganesha looks so cute. Nice to know more about u. Very sensible and meaningful crispy answers.